The Flycatchers Have Arrived	Cuckoos! Wednesday, May 28, 2014. 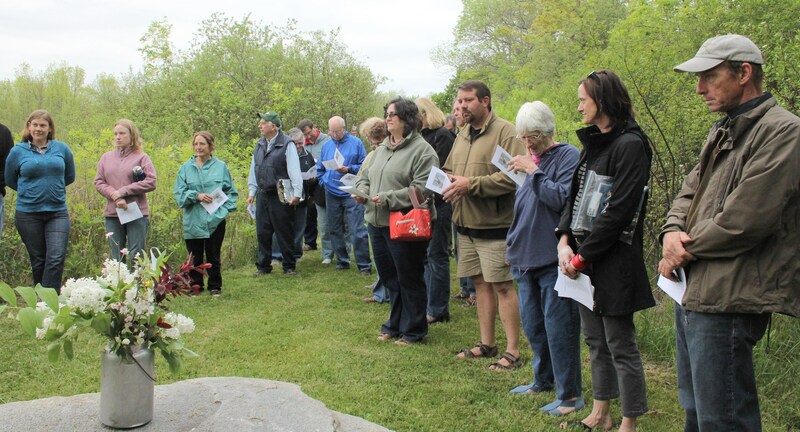 It was a lovely evening, and a large crowd ‘remembered’ two men in our annual Memorial Garden ceremony. ‘Reg’ served in the United States Navy during World War II. He loved skiing, sailing and spending time on Mudlunta Island in the Thousand Islands. And he always had a great story to tell! Joe was a Kodak chemist. He loved everything outdoors … trout fishing in summer, ice-fishing in winter, gardening, refereeing his girls’ Angela and Jules softball games, and sailing with Barb.